The Football Association of Wales will hold talks with Scotland on a joint bid to host the 2016 Euro Championships. Uefa, European football's governing body, had encouraged Wales to enter a joint bid with Scotland and Ireland. Former Scottish FA chief executive David Taylor had ruled out a triple bid from the Celtic nations, but a proposal with one partner may yet be considered. 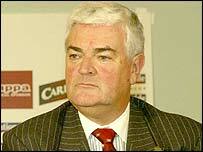 FAW secretary David Collins said: "At this moment in time we are floating the idea with Scotland." Wales are encouraged by Wednesday's decision to give the Euro 2012 tournament to Poland and the Ukraine at a meeting which was held in Cardiff. "It's raised the issue for us that there's the possibility of Wales and Scotland getting together to make a joint bid," Collins told BBC Wales. "We will start talking with the Scottish FA to see if they feel they could join with us and hopefully in the next few months we will have a clearer idea. "Then we could get the Scottish parliament and the Welsh assembly government to see if we could move forward to put a bid together." Collins has been considering a potential joint bid with Scotland for some time, after telling told BBC Sport last December that he was exploring such a move and then outlining further plans last month. All bids must have eight stadiums with at least 30,000 seats and Wales were hampered by having just one stadium that met Uefa's guidelines - the 74,500-seater Millennium Stadium. That could change with the planned new stadium for Cardiff City, and Collins says the FAW will look into the possibility of developing Swansea's Liberty Stadium and Wrexham's Racecourse Ground. That would give Wales the necessary four stadia to pull their weight with the Scots, who boast a number of top grounds including Hampden Park, Celtic Park, Ibrox and Murrayfield. However, Uefa is looking at the possibility of expanding the finals to include 24 rather than the current 16 teams, which could require further stadia. Taylor ended his spell as the SFA chief at the beginning of April to take up the post of Uefa general secretary. An SFA spokesman responded to Collins' comments by saying: "We have had no formal approach from the Welsh FA." Euro 2008: "Let's go for it!"